These have always been convenient. Keep your eyes open as you drive. If you come across a rest area with a dump station, take advantage of the opportunity even if not absolutely necessary. It could be awhile before you have another chance. These are almost always free. State, national and federal parks are still great places. 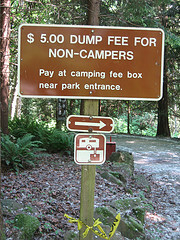 If you camp, there is almost never a fee. If you don’t, then prepare to pay about $5 to $10. If you stay, the dump is free. But if you need to simply dump and run, it will cost you $5 to $15. Most KOA campgrounds offer such a service. Their parks span North America. Stop at one and pick up a free directory. You may have to do some research to find these, but once you do, make a note so you can return again. Flying J has always been a favorite place. Nowadays, many are charging a fee. Still, when your RV has “gotta go” this may be the only option for miles. Check other truck stops, too. Keep your eyes open. Many still offer the service, and for free. Most have a dump station. Ask. They may charge you, but maybe not. However. . . never do this! Never dump by the road or down a street drain. It’s illegal and creates a serious health hazard. If you get caught, you’ll pay a stiff fine and even land in jail. RVers who use environment-friendly soaps may be able to dump their gray tanks (from shower and sinks) in certain areas with permission of the landowner. But never, ever dump a sewer tank except at an official disposal site! To help locate dump stations, pick up The RVers Guide to Dump Stations, a comprehensive guidebook to public facilities across the USA.